I'm currently doing coursework for one of my subjects and I am building an application to assist a student in memorising certain things within Maths that give them an advantageous edge in exams. The issue I am having is within my write up I can't seem to find anything better to say rather than "Helping students remember handy things for the exam". Any term or phrase that can say this in short or in a better sounding way would be greatly appreciated. Enchiridion is a formal word for a single page, or a small booklet, with essential information. The Wellcome collection has a Physician's Enchiridion on a single folded parchmnent. 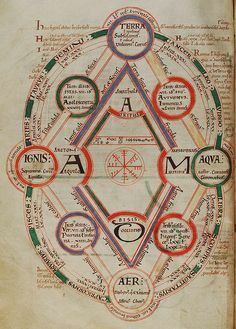 Byrhtferth's Enchiridion (there are several copies) is an English medieval diagram comparing the Seasons of the Year, with Child> Youth> Adult> Elder in people, and with the Elements (Earth Air Fire Water). The Microcosm/ Macrocosm principle was an attempt to find some order and structure to knowledge and experience. \ To distinguish "principal" from "principle" use the mnemonic aid "the principal is your pal." It can be used as a noun or an adjective, but it refers to a single 'handy thing', so you probably need the plural. There's also the idiom cheat sheet which is also used without the intention of actually cheating on the exam. What's a good term/phrase for things of a specific branch everybody should know? Is there a word for excessive use of articles? Is there a term for the character trait of assuming things about people? What's the general term for something to which things can be assigned? Is there a term for the point in time when a product can begin to use itself? Is there a word or a term for when you say you don't know how to do something when you actually do know? Is there a word or phrase to describe someone who wants to know things they can't, or shouldn't?